PRODUCT DESCRIPTION: Heavy PVC cut to fit the RATICATOR PLUS or RATICATOR MAX. 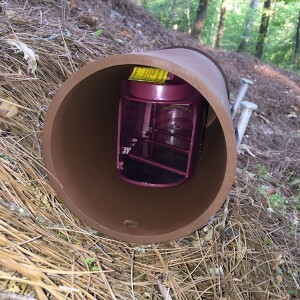 Trap Tubes are open on one side and capped on the other so animals can only enter one way. There are two small holes on the side of the tube for water drainage. One of the holes is also used to secure the tube to the ground (see below). 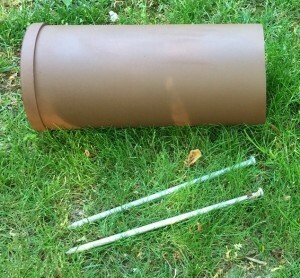 Use trap tubes for placing zappers outside in the yard. 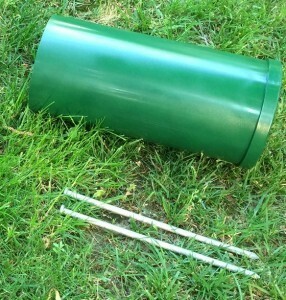 By using a Trap Tube, your zapper will be well protected from local rainfall, irrigation systems, etc. It's important to understand the Trap Tube won't fully protect the Raticators from all water since it can enter the same way as the target animal. But for the most part, the vital electrical components of either Zapper will be well protected from rainfall and "normal" levels of moisture. Trap tubes are a great way to camouflage Rat Zappers so they can "blend" into the local environment. Each tube is about 15" long, 6" high and weigh in at 4 lbs. They're quite sturdy and can withstand over 100 lbs of weight no problem so your zapper will be well protected inside their tube. 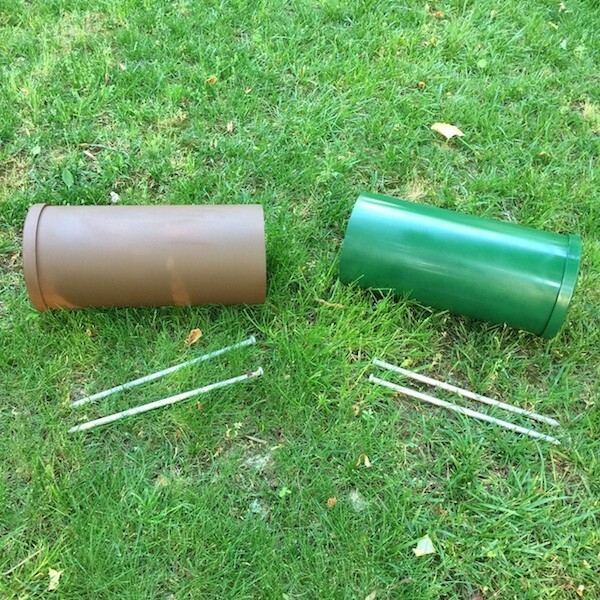 We offer Trap Tubes in either brown or green. We include two 12" spikes used to secure the tube. When using a Trap Tube on flat ground, one spike is needed to prevent the tube rolling. Lightly "hammer" the spike through the mounting hole found just inside the tube. Once in the ground, the flat head of the spike will be just before the zapper as seen below. Use both spikes when making sets on a hill. Basically you hammer in both spikes first, about 6-8" apart and about 6" down in the ground. Next, lie the Trap Tube alongside them so the weight of the tube keeps it in place. Make sure the Zapper is "level" inside to insure it functions correctly when target animals enter. 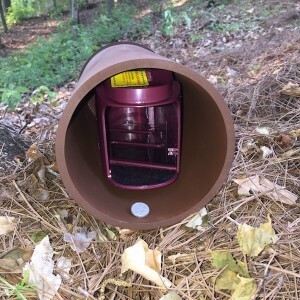 WHERE TO USE TRAP TUBES: Generally these are used outside by a tree, under a bird feeder or by a point of entry known to be used by target animals. We offer them in both green and brown so mix and match based on where you intend on zapping. Zappers can be used for a wide range of animals including but not limited to mice, rats, chipmunks, ground squirrels, gray squirrels, prairie dogs, voles, shrews and even lizards. RATE OF APPLICATION: Each Trap Tube can hold one Raticator Plus or one Raticator Max.